I am so glad that i can share another free pattern to you all. Last month I went to my hometown to visit my parents... almost 4 years I didn't met them. I just spent my time with my family and had no time to crochet or write in my blog. 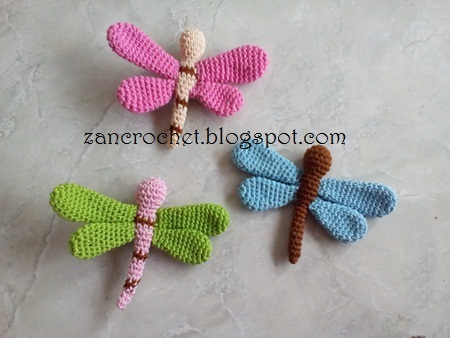 I hope you like this very simple pattern and enjoy crochet it..
Sew upper wings and bottom wings to body. This pattern is an made by me, Zan Merry. Please do not claim this pattern as your own. If you wish to share this pattern, you may link this pattern but please do not reprint it to your site. You may keep a copy of this pattern for personal use but you may not sell this pattern. You can sell the items that you made from this pattern. Please leave comment if you have a question or find any mistake in my pattern. I will do the corrections and answer your question as soon as possible. Note: This pattern has been edited on October 14, 2016... I missed some rows in the first pattern... i am sorry for this inconvenient. What yarn would be used for this pattern? Hi, Do you do any video tutorials for your beautiful work. I am new to crochet and though I can copy and make things watching on Youtube I am still unable to read crochet instructions. I would love to make this Dragonfly. Any help would be greatly appreciated. Thanks. I don't want to comment as Anonymous but don't have much choice here and I am new to all this so don't know what to do. I have liked your 'page' Zan Crochet from my fb account. Monica. The upper wings in the picture seem to have 15 rows, the bottom ones 11. When I follow the pattern, they look much smaller... and less like dragonfly wings. Is the pattern wrong or am I? What size do these end up being? They are so cute, I'm going to have to browse through you patterns. Thanks! I am so very much in love with this pattern! Dragonflies have a very special meaning to me. 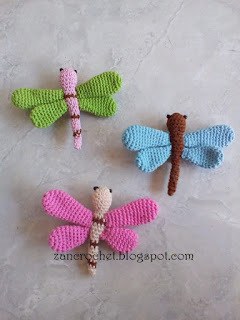 I am going to make a dragonfly mobile and hang it in my kitchen... As my walls are covered in dragonflies! Thank you from the bottom of my heart! You do amazing work!